IBM DevOps Bluemix Cloud Development Services Company in USA. It provides huge flexibility, lesser down the cost and does innovations in the IT field. It is highly useful for saving time by reusing software as per the development need. IBM DevOps approach helps enterprises to face quick software delivery with an innovative touch. IBM Bluemix follows easy deployment and testing of different applications in less time. 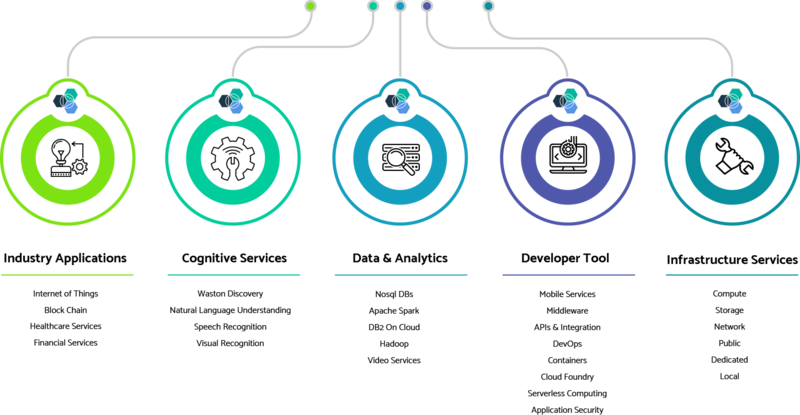 IBM Bluemix offers a highly flexible infrastructure for managing the development process. It offers an integrated environment for developers to deliver code automatically without installing scripts. Bluemix permits coders to deliver business value and scales elasticity of environment based on business need. Bluemix has integration with different source control management systems for providing fast development of any project. We have a team of experts for finding your workloads and providing an appropriate solution for your business. Our professionals are trained in establishing a safe and secure gateway for connecting your apps with in-house infrastructure. We offer different solutions for managing your data which supports different cloud environments. Our cloud experts will assist you in dealing with data and develop different solutions using IBM Watson in the cloud. Bluemix has the best integration potential in the cloud for connecting data & services and converts them to API. Bluemix provides authenticated policies and solo sign-in ability to protect your data and full control access. We are highly skilled in building intelligent programs using Bluemix services on cloud foundry apps. Using Bluemix IoT expertise, you can expand your app reach and services on all devices and integrate with the cloud.